Wine lovers unite in Galena on March 23-25 for the 7th Annual Wine Lovers’ Weekend, one of the largest indoor wine tasting events in the state of Illinois! Enjoy a spectacular weekend in Galena and beautiful Jo Daviess County indulging in wine tastings, winemaker dinners, shopping, winery tours, and lodging and spa specials. Tickets for the Grand Tastings—offering sampling from more than 300 wines—available now online: http://www.wineloversweekend.com. Tickets are available online now for Galena’s extremely popular Grand Tastings during Galena Wine Lovers’ Weekend. This year’s event is slated for March 23-25, with Grand Tastings being offered on Friday, March 23 from 5:30 to 8:00 pm and Saturday, March 24 from 3:30-6:00 pm at the Galena Convention Center, 900 Galena Square Drive, in Galena, Illinois. After selling out three weeks before the event in 2009, the committee expanded to offering two Grand Tastings in 2010, both of which also sold out. Tickets are $30 in advance / $35 at the door, subject to availability, and may be purchased online: http://www.wineloversweekend.com. Why are the Grand Tastings so popular? They provide epicureans of all levels the opportunity to choose from more than 300 varieties of hand-picked wines and spirits to sample. Admission also provides you with a keepsake wine glass and an opportunity to win a wine-themed trip to San Francisco. Additional trip chances may be purchased for $15 each. The wine silent auction includes items such as vintage wines, artwork, large format wine bottles and related items of interest. Now in its seventh year running, Galena Wine Lovers’ Weekend is a community-wide celebration of good wine, good food and good friends. 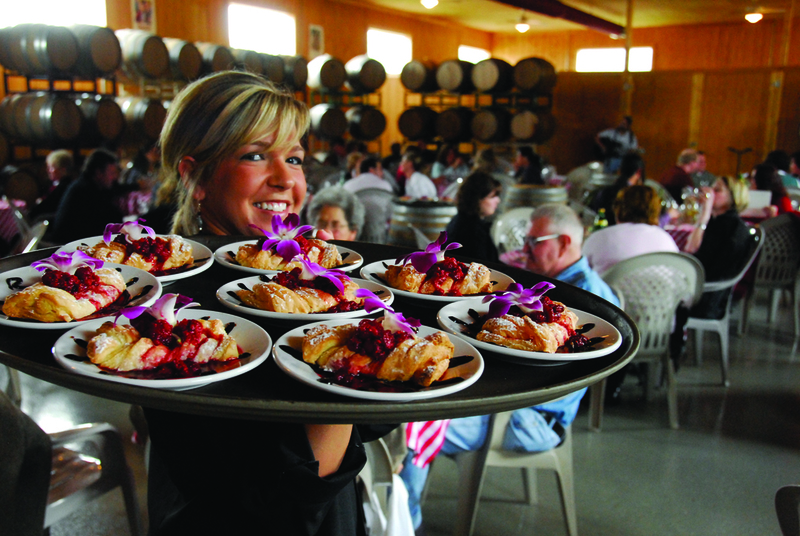 Wine lovers of all sorts are invited to enjoy three event-filled days of fine wine, culinary delight, celebrity chefs, wine makers, pampering packages and all of the stops Galena can possibly pull out. Galena Wine Lovers’ Weekend is a spirited way to warm the winter and add romance—whether it be for vino, gourmet cuisine or the love for a town with history and charm all its own. Wine-inspired dinners, spirit tastings, spa experiences, history tours, cooking demonstrations and shopping welcome and enchant visitors. Lodging specials and package deals fuel the passion. From dining packages to pampering in luxurious accommodations and the warmest of hospitality, Galena’s finest provide a variety of options to cater to every taste and budget. Visit http://www.wineloversweekend.com for a detailed listing of extended-weekend activities, links to lodging, and an opportunity to purchase tickets online. Additional area offerings may be found at these local tourism sites: Galena/Jo Daviess County Convention and Visitors Bureau: http://www.galena.org and VisitGalena: http://www.visitgalena.org.